I am always asked how Raffe Reeds Get Their Signature Outfits. Pictured Below! I experimented with a lot of wrappings before I decided on wrapping with FF Thread and Duco Cement. Next is a picture of reeds from when I was in high school and studied with Mark Eubanks, the original owner of Arundo Reeds. The wrapping is a chemical solution that requires paint thinner. (Yikes!) I also shied away from this because it was too easy to glue the second wire down. See the top teal reed pictured. The solution covers the wire, altering the ability to vibrate as part of the reed. And then, if I replaced the wire, it had a tendency to chip the solution. Let me know if in a future blog you would like a discussion of the FOUR WIRES! And Different Wire Weights. 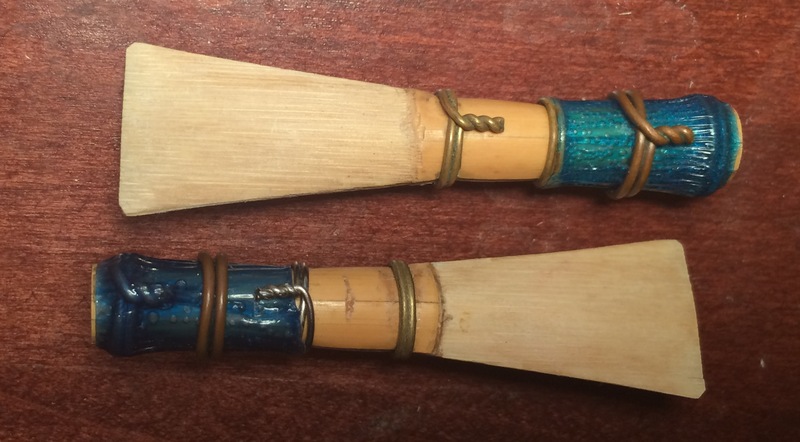 Mark Eubanks Reeds: A Chemical Solution Tinted Blue AND Four Wires! Many of my friends in the Tennessee and Georgia area use glue from a Hot Glue Gun, pictured next. I do admire the glitter hot glue! Not only is it fast- It comes with Sparkles ALREADY IN IT! The reed pictured here is is Blue with Red and White Sparkles- very PATRIOTIC! It was a summer reed by a colleague of mine in Atlanta. Sometimes they even use Cotton Thread and then Cover the Thread with Hot Glue. But I am prone to burning myself with hot glue guns- so I stick to FF thread and Duco Cement. Reed Sealed with Hot Glue from a Glue Gun. A note on Shrink Wrapping (as I had a student recently ask). I don’t use it because it can become loose and fall off. 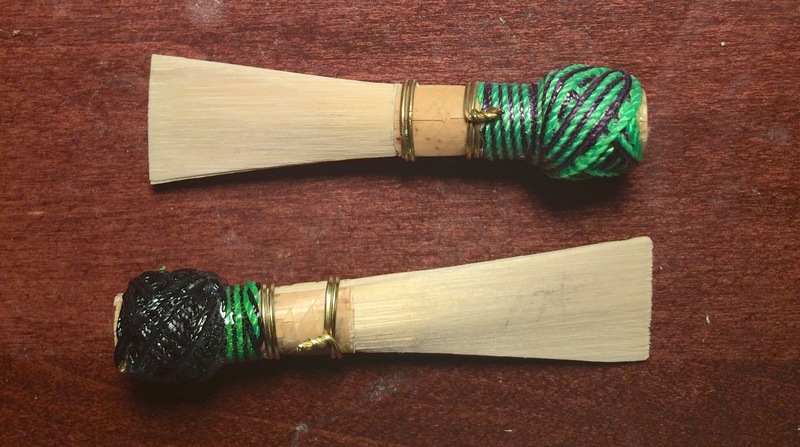 The wrapping should help seal the reed- when it breaks loose, it no longer supports the seal. I’ve also found that it doesn’t adequately weight the reeds. And I am accident prone- I drop my reeds (especially when nervous). I need that weight to keep from cracking the tip. Hope You’ve Enjoyed the REED FASHION OPTIONS! HAPPY BASSOON REED MAKING, EVERYBODY!